About the Book Paul Zann is a much-published writer of children´s and adult novels, short stories, essays, plays, and poetry. His poems have appeared in journals in Canada, United States, England, Spain, and Australia. Two of his children´s animal books, The Aussie Six in Canada and The Aussie Six in Australia, have been published by Borealis Press, Ottawa, with The Aussie Six in Spain to follow soon. Paul is an Australian born Canadian citizen who lives in Truro, Nova Scotia. One of his many interests is playing an Extra in TV movies. Among his many roles, he has been a jury member, a fisherman, a dead man in a casket, a Viking warrier, a Norwegian priest, and a drunken convict in The Trailer Park Boys. His poetry with its description imagery and gallery of unusual characters is enjoyed by readers of fine poetry. It is also praised by readers who admitted that they did not know they liked poetry at all until they read his - a high compliment, indeed! Paul Zann (1932- ) emigrated from Australia in 1968 and is now a Canadian citizen living in Truro, Nova Scotia. 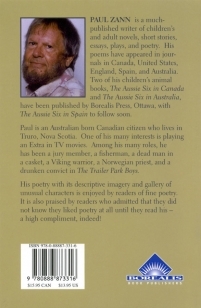 Borealis has published his two novels for young readers: "The Aussie Six in Australia" (2004) and "The Aussie Six in Canada" (2003). His publications include "The Weirdest Class," a children's book; "A Real Son of a 'Vitch!," a humorous novel; "Strike," a musical; and "The Parasite/s," a play. He has also written short stories and poetry and Borealis Press published his collection of poetry "Crouching at the Keyhole" in 2007.